Paradise Lost: The story of Adam and Eve’s original sin, the stunning production by the Basilique Performing Arts company, which ran from April through June in its first season run will be returning in August for a second season, commencing August 2nd, 2014. The news came via an announcement on Canary Beck’s blog on Tuesday July 15th, together with a link to the box office on the SL Marketplace. October: Saturday October 11th and 25th; Sunday October 5th and 19th. I was privileged, along with a number of other bloggers, to be able to preview the production ahead of the first season run. I also had the opportunity to join the creative team behind the production, Canary Beck and Harvey Crabsticks, in conversation about the production’s genesis and technical aspects. 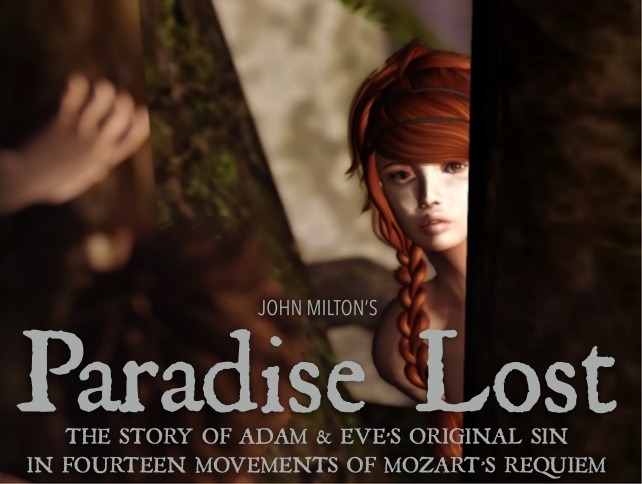 So I can say hand-on-heart that my description of the production as “an outstanding masterpiece of performance art in SL” is no exaggeration; Paradise Lost is truly an extraordinary piece, one not to be missed. So, if you didn’t manage to see the production during its inaugural season, I strongly encourage you to set aside one of the dates listed above and get your ticket(s) now, particularly as, if the original run is anything to go by, they are liable to sell out fast.